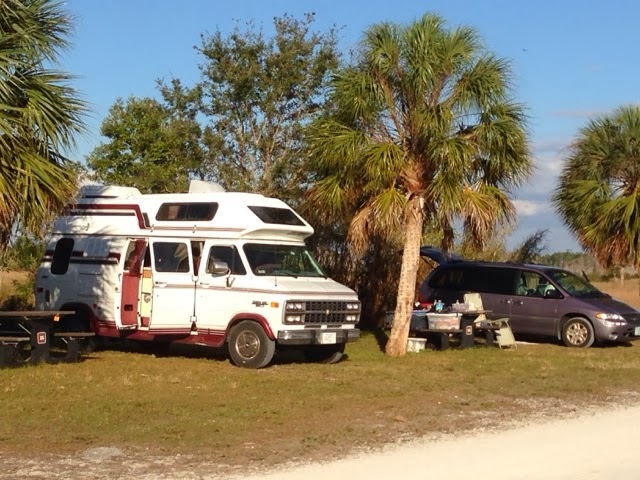 I met Norman in the Everglades campground as he was in the spot next to me. He was camping out of his Christler van having removed the rear seats and modified the rear hatch area to accommodate some storage and TV. Norman was having a hell of a time with his Coleman camp stove on the picnic table as the wind was blowing and it would shake the cover connected to the sides and it would disassemble and fall apart and his flame would go out. This happened a number of times so I asked him if he wanted some duct tape to temporal hold the corners. He said no and that he had some but thought that some small chains would work well. Necessity does drive solutions. Norm was doing what I originally planned to do with my pickup truck. Modify something you already have save money and well live out of your car. My camper was a plaice compared to anything I had planned and considering the time of year driving and camping it would have been a challenge to say the least. I was first asked by Normsn where I was from and I later learned he was from upper NH near Conway. He has apparently bern doing ths kind of camping for sometime and enjoyed the socialization with whomever passes. In his 60's like me he seemed to be enjoying life speaking fondly of his son. I was able to get two Miami TV stations while I was there and Norman couldn't get any. I showed him my setup and suggested my antenna but was high tech and a bit expensive at $60+. Another option if he has space is an amplified parabolic style for about $20 from Hartland America. Norman's van is to the right of mine. I forgot to check your blog for a few days - my you've been busy! I like the new travel map in the upper corner. Weather looks nice! Hope you're feeling better.